Champion ONE’s multi-service aggregation multiplexer (MSAM) is the industry’s first solution to provide support for 1/10Gbps PON, CWDM, and RFoG services over a single fiber with an integrated monitoring port. 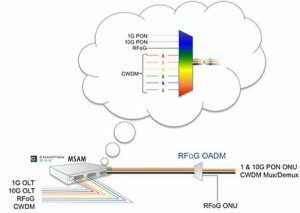 This revolutionary device prevents frequency issues between 10G PON and RFoG at the subscriber, allowing operators to implement a high-capacity access solution without compromising performance. It will also reduce the footprint of passive solutions, and allow FTTP service providers to maximize their ROI on existing infrastructure. The Champion ONE FTTx optical tap system is designed to accommodate easy installation access to GPON/EPON/RFoG optical distribution networks (ODN). The robust cassette design can accommodate a wide variety of splice enclosures. The taps are broad spectrum single mode fiber devices that pass all the standard wavelengths of current and future Passive Optical Network (PON) technologies. The tap module is spliced in-line with the OSP fiber, taps off some of the power from the distribution fiber, and divides it to the fiber drop that feds the individual service locations. The tap ports can be connectorized or provided as unconnectorized to facilitate fusion splicing. This system is similar to the traditional Hybrid Fiber Coax (HFC) Radio Frequency (RF) network that cable television operators build. 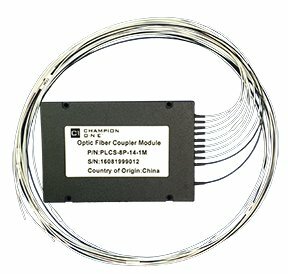 The splitters are broad spectrum single mode fiber device that pass all the standard wavelengths of current and future Passive Optical Network (PON) technologies. The splitter module ports can be connectorized or provided as unconnectorized to facilitate fusion splicing. Please consult your Champion ONE sales representative to customize the splitter to your application.